Encephalartos senticosus is a quick-growing, glossy dark green giant cycad for your ornamental garden. This frost-hardy cycad prefers subtropical to warm climates and, as in many cycad species, it appreciates being planted in well-drained soil in sunny and partial shade areas. Encephalartos senticosus is a quick-growing cycad, up to 4 m high and with a stem of about 300 mm in diameter. The stem is covered by remains of leaf bases, and has a woolly crown. The leaves are of medium size, about 1.1-1.8 m long, rigid and straight to somewhat arched and glossy dark green. The rachis (the axis of the leaf) is yellow and the leaflets are smaller in size towards the base of the leaf. They are hard, narrowly ovate and toothed, with the apices forming spines. The cones are 3-4 per stem, usually appearing in December. The male cones are narrowly ovoid, orange to orange-yellow, on short stalks up to 100 mm, and covered by tawny, felt-like hair. They shed the pollen in April and May. The female cones are ovoid and pale to bright yellow. The exposed surface of the cone scales is smooth and raised pyramidally. The cones disintegrate spontaneously from September to October, each yielding 280-590 bright red seeds. In the last 60 years, vast numbers of Encephalartos senticosus have been removed from their natural habitat, primarily for landscaping purposes. According to Raimondo et al. (2009), Encephalartos senticosus is regarded as Vulnerable (VU). 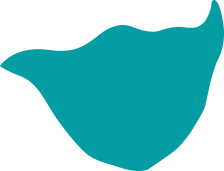 This is the category used when the best available evidence indicates that the plant meets any of the five IUCN criteria for Vulnerable. Therefore it is probably facing a high risk of extinction in the wild. Encephalartos senticosus has a well-defined range, scattered along the summit of the Lebombo Mountain range from south of the Jozini Dam in KwaZulu-Natal, northwards to a few kilometers north of Siteki in Swaziland. It grows on very dry and sunny cliffs, also on gentle slopes, between boulders and within shrub clumps, at altitudes of 400-800 m above sea level. The name of the genus Encephalartos was derived from a Greek word for "bread in head" and refers to the floury, starchy material in the trunk of some species used traditionally as food. The specific name senticosus means "spiny" and refers to the plant's leaves. The species was previously included under E. lebomboensis, and was only separated in 1996 as a species on its own by Piet Vorster. The two species can be differentiated by their cones. The male cones of Encephalartos senticosus are woolly while those of E. lebomboensis are never woolly; the female cones of E. senticosus have a rough, outer surface while the female cones of E. lebomboensis are smooth on the outside. It is also closely related to E. natalensis. 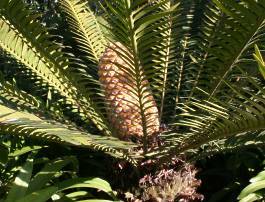 Pollination of this cycad in its natural habitat is effected by insects carrying pollen from one plant to another. The fleshy male cone does not elongate much prior to pollen shedding, and it yields little pollen, which sticks together in balls when attempts are made to sieve it. Pollination takes place in late April and early May, and seeds are released in October. Seeds are dispersed by birds, baboons, monkeys, rodents and bats, as they forage on the fleshy pulp which drops off the seed. Encephalartos senticosus is generally grown as an ornamental plant in gardens. Encephalartos senticosus grows relatively easily in a home garden and is frost resistant. The species prefers subtropical and warm temperate regions. Give it a well-drained soil in full sun or partial shade. Keep seedlings in shade much longer than those of the closely-related species E. lebomboensis (Mananga form). In suitable conditions E. senticosus grows very rapidly, reaching an appreciable size within 5-10 years. Seeds germinate about one year after having been released. E. senticosus also makes a good container decoration plant. 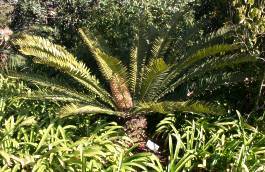 Permits are needed to possess cycads. Please contact your provincial nature conservation authority for details. Boon, R. 2010. Pooley's Trees of eastern South Africa: A complete guide, edn 2. Flora & Fauna Publication Trust. Durban. Claassen, I. 2000. Focus on Encephalartos senticosus P.Vorster. Encephalartos 63: 4-10. Grobbelaar, N. 2002. Cycads with special reference to the southern African species. Author, Pretoria. 281-283. Jones, D.L. 1993. Cycads of the world : Ancient plants in today's landscape. Reed, New South Wales. Vorster, P. 1996. 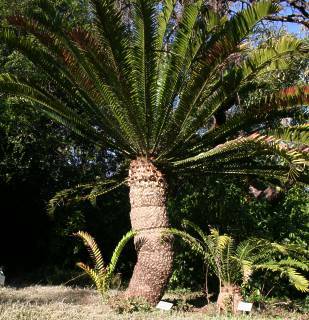 Encephalartos senticosus (Zamiaceae): a new species from Northern KwaZulu-Natal and Swaziland. South African Journal of Botany 62(2):76-79.